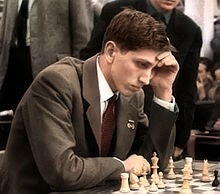 Robert James “Bobby” Fischer, born March 9, 1943, was the strongest American Grandmaster ever. Many consider him the greatest chess playerof all time – and they are right. See how Fischer punished Byrne for his serious mistake by CLICKING HERE!!! !